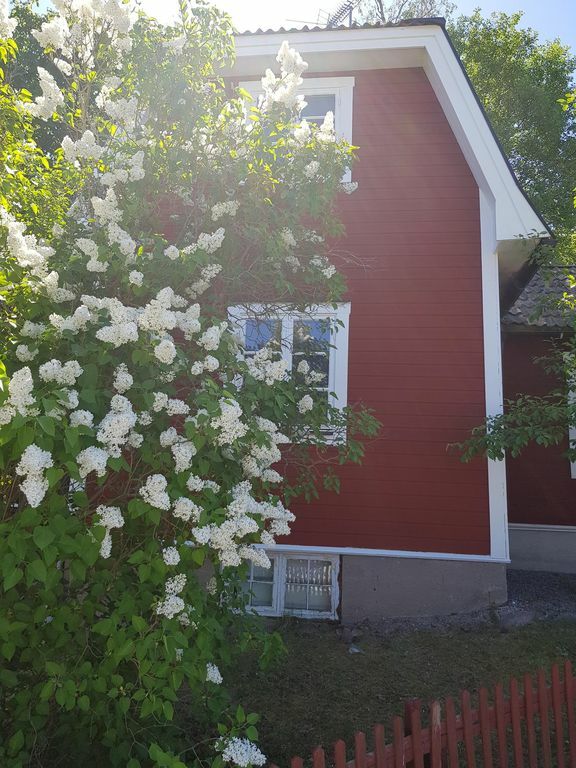 Small, cosy, quaint house built in the 1920's and refurbished in 2018 and 2019, located in the countryside 1 hour north of Stockholm. Access to garden and parking available. Five minute walk to lake for swimming as well as to grocery and other shops in town centre. Convenient location for Arlanda airport (35 minutes), Uppsala, Norrtälje and Stockholm. Bus stops nearby, so a car isn't strictly necessary. We - Carina and Roger - moved out from Stockholm to Rimbo in 2014, in a desire to have additional living space and the all-important garden. Carina is a professional translator who works from home, and Roger commutes to work at the Swedish Prison and probation Service in Stockholm. We bought this property, which is adjacent to the one we live on, when is came on the market in 2017. It seemed natural to join them together and increase the outdoor space. Accordingly, you might meet us in the garden, which you of course are free to use also. The small cluster of houses where we live were built around 100 years ago by and for the employees at the nearby brickworks. Most of the houses are traditional Swedish wooden cottages painted red with white gables.